We secret shopped our competitors and found our sparklers burn the longest and brightest. 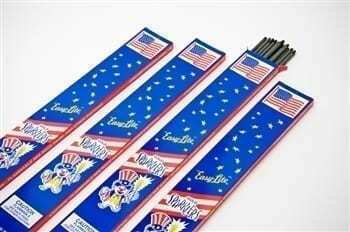 They are the best quality sparklers available in the US. 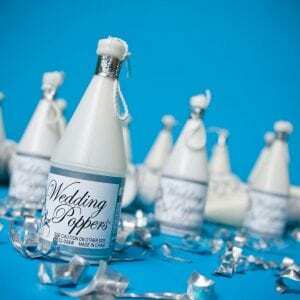 These 20-inch sparklers are our most popular size for weddings. Don’t settle for second best! Perfect #20 Inch Sparklers for Weddings! Our BEST Seller – Now On Sale! Best Seller and Best Quality! 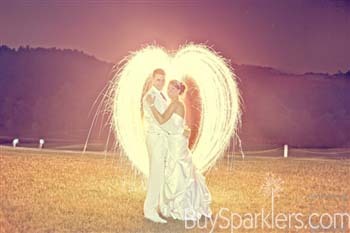 This is our most popular size of wedding sparklers and the best quality available in the USA! These sparklers burn bright and out sparkle our competitors. 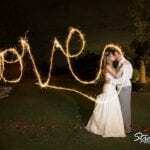 Count on us for the best quality 20-inch sparklers to make your wedding send off picture perfect. It will be a moment you and your wedding guests won’t forget! Featuring Metal Wire Rods: Be sure to buy metal wire sparklers and skip the bamboo or paper sparklers (Morning Glories) for your wedding. Bamboo and paper sparklers will smoke and ash a lot – which risks dropping ash on you and your guests and filling up your pictures with smoke. Custom Wedding Boxes: These wedding day sparklers are packaged in our custom designed white boxes with black and silver print. The sparkler boxes can be displayed at any event and were designed with the most elegant wedding in mind. They are beautiful to display or hand out as favors. These wedding sparklers measure 20 inches long and will burn for 2 minutes. 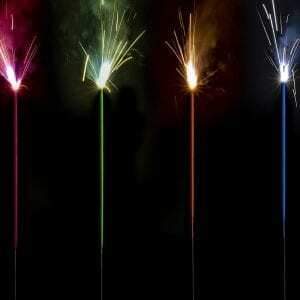 The #20 Inch Wedding Sparklers feature metal wire rods which produce less smoke than sparklers made of bamboo sticks. 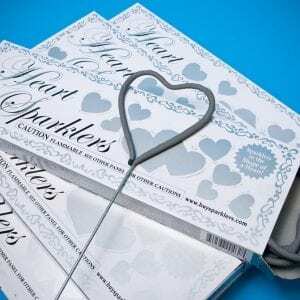 One order includes 4 boxes of 12 wire sparklers (48 total sparklers). How Many 20 Inch Sparklers Sparklers Do You Need? 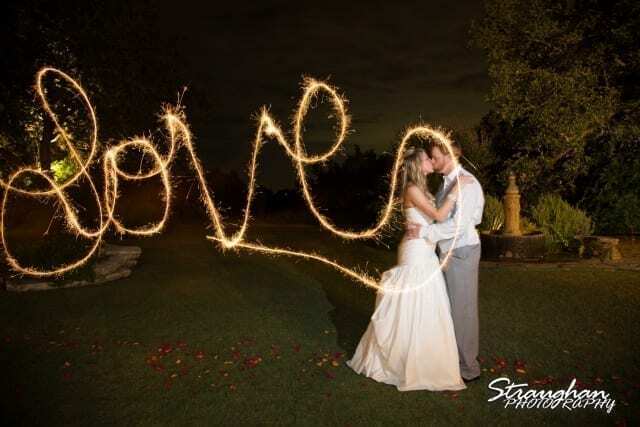 We recommend ordering enough for 2 sparklers per person to allow your photographer enough time to capture the moment. Your guests will be thrilled to participate! Tips for Lighting: Plan to light the first wedding sparklers with a butane or barbecue lighter (a match isn’t strong enough). Ask guests to dip unlit sparklers into a lit sparkler to pass quickly through the crowd. Each order includes a free pack of eight 10-inch sparklers to help the lighting process go quickly. Friendly Reminders: These sparklers are recommended for outside use only. Hold sparkler at arm’s length when burning. Adults should supervise children, not recommended for children under age 8. 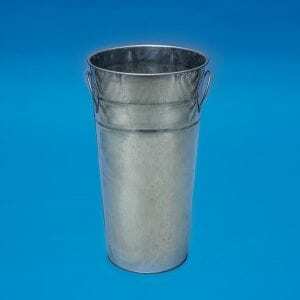 Be sure to have a 15″ Galvanized Metal Bucket filled with sand or water on hand for guests to place their used sparkler in. Your wedding venue will be thrilled that sparklers will not be tossed on the ground. Nicole, Thank you so much for all of your help with our wedding sparklers. You have shown outstanding and professional service throughout this entire purchase process. I sincerely want to thank you for being so polite. I wish more retail personnel were as committed and caring as you have been. Again, thank you so much for working with me throughout the many questions and changes. I will definitely recommend your company to others! I just loved having the sparklers, it was a must have for me, and I am so happy with how the pic’s turned out with them, it was like icing on the cake for me!!!! So thank you for your great product. I wanted to write to thank you for providing the sparklers for our wedding My wedding was in November and that morning we realized we had totally forgotten to buy sparklers- it just slipped through the cracks. My mom and a friend found you on the internet and called to see if we could buy some for the wedding that night. You were amazing and set out an order for us to swing by and pick up and it totally saved the day! I am so grateful that you were willing to work with us on such horribly short notice. The sparklers were a great touch and I cannot thank you enough. Thanks again!! Awesome! You just made my Wedding Day!!!! I bought your sparklers for my daughter’s wedding and they were GORGEOUS!!! The best day of my life!! Thank you!! These sparklers were perfect for our send off at the end of the night. The sparklers lit easily and lasted long enough for us to run through the tunnel twice! The sparklers were amazing and a huge hit at the wedding, it was so fun to walk through a beautifully lighted path! Thanks for great service! Nicole, Thank you so much for getting back to me so quickly! I really appreciate you taking the time and for the explanation…I really appreciate it. Also – will be sure to recommend your company moving forward. As someone who is also in a service industry, I can’t tell you how much I appreciate you getting back to me so quickly and for your help. Have a great day! The sparklers worked great and were a huge hit! Everyone LOVED the wedding sparklers – they were amazing to the adults as well as the kids! The bride and groom danced out to them and it created such much more fun than throwing anything “at” the couple. It really was a nice, visual ending! My wife and I recently got married this past May. She was completing her last year of college and was extremely busy, so I planned most of our big day’s details, while she watched our budget. Needless to say I wanted the very best and to remember this party for a lifetime. So we were eventually over budget and beginning to realize some of our amazing ideas would not become a reality. However, one night I decided to do some shopping to see what sparklers I could find and make it a surprise for the fiancé. I found an incredible deal at BuySparklers.com. Not only affordable, but high quality and arrived earlier than expected. My fiancé found the package and couldn’t believe I bought more things for the wedding. After a heated conversation, I assured her that my idea would work and it would be most memorable. She was pessimistic of what the outcome of my idea would be but she eventually came to terms with my decision. I know many people say this, but we found it true. The wedding day goes so fast. It is almost like the blink of an eye. We tried to take every moment in and hold on to it as long as possible. I guess you can call me a romantic and a emotional reck of a groom. Anyways…about half way through our reception the now wife and I ran outside with some of our close friends to help with the photo idea. Using the excellent sparklers, we have some of the most amazing heartfelt pictures. Timeless, romantic, and enchanting the sparklers added that extra touch of class. I will forever remember that moment with my beautiful bride. Us giggling holding still as our friends pranced around. Our photographers saying with excitement “this is amazing.” And of course the I told you so comment. From the bottom of our hearts. Thank you for helping make an everlasting memory. I loved my wedding sparklers! I knew we wanted to have a “sparkly send off” and my wedding planner recommended only using the sparklers from BuySparklers.com! The sparklers gave our wedding the perfect, classy finishing touch! Looking forward to using the sparklers at my wedding in April! My wedding planner raved about your sparklers! We love using Buy Sparklers.com. They are a local company, and carry quality products. Why go anywhere else when you have Buy Sparklers right here in town. They are accommodating, and offer fair and competitive prices. We use them all the time, and will continue to do so! What a festive way to end your day! The price, quality and customer service from BuySparklers.com can’t be beat! I recommend the services of BuySparklers.com to make your Wedding Day a one-of-a-kind event that will be remembered and cherished by you and all your guests for years to come! Hands down this is the vendor to go to for long burning sparklers. Fast service, I love that they are local and I can pick them up. Have always helped me out in a pinch when I or any other planner around the country has needed sparklers last minute. Thank you! To buysparklers, please give special thanks to Nicole who was able to help me with making my purchase, I’ve called 16 other places and none of them could do so. She was able to tell me shipping time/fees and also walk me through with the product details and which size would be best for my budget, I usually do not enjoy dealing with people over the phone and she made this experience very pleasant. I have friends who are engaged as well and will DEFINATELY send them to your business on the fact that how helpful nicole was to me. I look forward to receiving your product and we will send pics of how it comes out! We ordered sparklers from another company and when we tested them out, they were a big flop! We quickly ordered from BuySparklers.com and were so happy with not only the quality of sparklers, but how fast they arrived. Nicole made sure we received our order in time. We LOVE Buysparklers!!!!! We ordered the #20 Sparklers that burned for 2 minutes. It was the perfect size for our wedding of 100 people. They were smokeless and so beautiful! I strongly recommend the sparklers from BuySparklers.com – they were everything I had hoped they would be!! Awesome customer service too! I ordered sparklers last minute and wAs surprised how fast they arrived! I was extremely impressed with the level of customer service I received – it is very rare to find someone so helpful. BuySparklers made my wedding so special with their beautiful sparklers! I highly recommend them! These women are literally life savers! They were extremely helpful & very understanding. I had a dilemma was with FedEx. FedEx had lost my shipment & had me all kinds of stressed being I needed my package within a specific time frame. I didn’t get any help from them. I called Nicloe and now needless to say I have a package coming my way & my event will be a success after all! They made my day so much at ease. Thanks a lot! Surprised my wife with sparklers for our wedding exit. I bought the 20 inch wedding sparklers and they were awesome. Great prices and superior quality. The staff was super friendly!